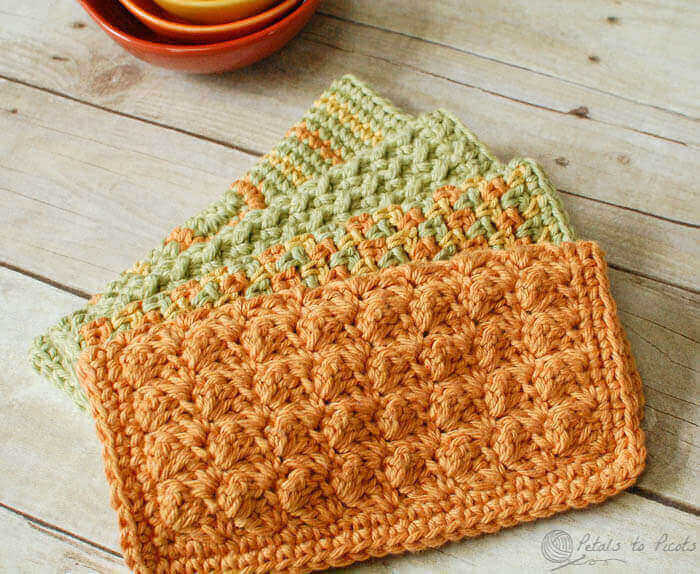 I love working up these crochet dishcloth patterns, especially in the summer. Crochet dishcloths are lightweight enough to be a great take-along project and work up quickly too. I find such satisfaction in making something pretty and useful in such a small amount of time! Plus, there is such a simple pleasure that can be had from using handmade dishcloths. And don’t stop at just one … they are also perfect to give as gifts! Add some scented soap or a wooden spoon set in a little basket and you have the perfect housewarming or hostess gift! 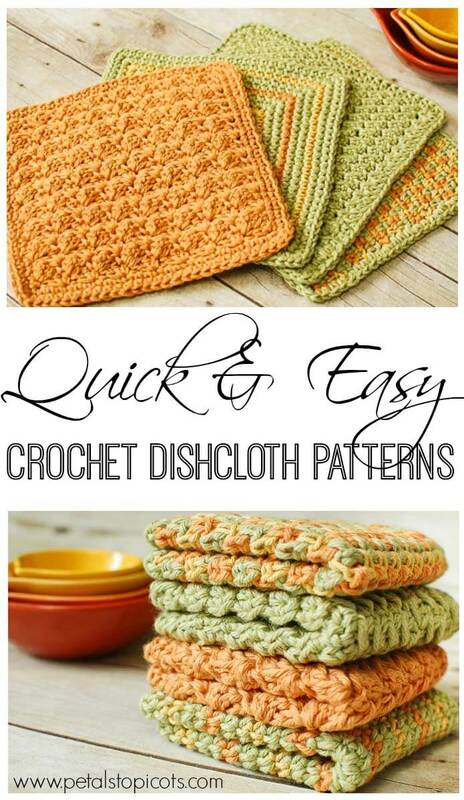 I hope you enjoy these quick and easy crochet dishcloth patterns! Bookmark this page or pin the image below so you can be sure to find the patterns again and again. And you know what? These crochet dishcloths continue being favorite projects even after the skills have been mastered. So break out that cotton yarn and get stitching! 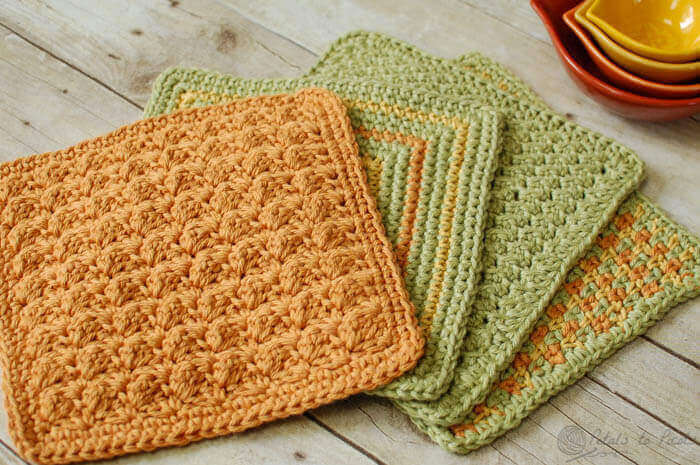 You can find the link to the free pattern for each of these crochet dishcloth patterns listed underneath the image below. The patterns are also available as a convenient ad-free pdf for purchase here on Ravelry. Ready for some more dishcloth patterns or perhaps another project to brighten up your kitchen? Click here for more Kitchen Crochet Patterns or click here to view my full gallery of Free Crochet Patterns. Browse my full gallery of free crochet patterns here. Thanks , patterns very welcome for a newbie! Hi Deborah 🙂 I do not have a video tutorial, only the written patterns through the links in the post. Is there any chance you have a video tutorial for these? Ooooh … that is a perfect gift! Such lovely dishcloths, Kara! Luv them! Very nice wash clothes, how did you get the photo gallery that is on top of your site? Hi Amy 🙂 Do you mean the slider that transitions the different pictures? That came with my theme, Canvas WooTheme. Hope that helps! where can I find the patterns for these dishcloths . Hi Brooke 🙂 This is a preview of what’s to come in July … I will have a kitchen pattern every week. I will be watching. Those are really cute. Glad you like them, Tess! Lovely dishcloths. Can’t wait for your patterns! Blessings..
You are so right about these making great gifts and practicing stitches. I look forward to your patterns – I like all four of them! Nice designs… Can’t wait for your Kitchen Patterns next month! Why can’t I access the patterns so I can view them? Hi Deb 🙂 This is just an announcement that next month I will be sharing kitchen patterns. I will share a new pattern each week. It’s next month!! Where can I find the patterns? I have lots of worsted weight yarn and can’t wait. Kara, I LOVE all 4 of these dishcloths! Once again, you inspire this knitter to grab her crochet hook! Cute patterns! I have some cotton laying around so I will be definately trying to follow! One question though: on what kind of temperature do you wash them in the washing machine (front loader)? I have washed mine several times in my front loading washer on the regular/normal cycle using warm water. They hold up really well! Hi Barbara 🙂 I just throw them in with the rest of my towels and rags on warm or hot and they come out nicely. Happy Wednesday to you too, Janice! I love dishcloths, too. These are lovely. Hi Christine 🙂 which pattern are you working on?